Finally Friday is right! This has been a long week. So I wanted to bring something bright and fun to the website today. My dear friend Melinda was under the weather, so I thought this would cheer her up while she waited for all of the medicine to kick in and send her back to the land of the healthy. 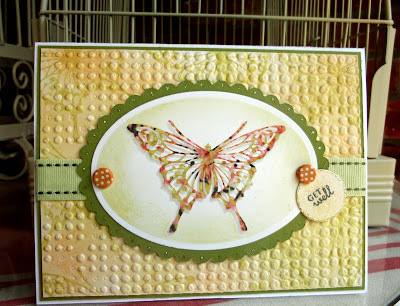 I only used a few dies on this card - so I'll tell you a little more about the techniques today and list the products below. The technique used to create this butterfly is called Embossed Marble and I saw it here for the first time on the Stamp TV website. If you try it, you will be hooked. Gina K. comes up with the best ideas! One thing I like to do when I have just one large image is this. First, I cut it out using a Spellbinders die, and then right away emboss it using the same die. I leave it in the die and then go around the edges with either chalk or ink. When it is removed from the die, there is a white edge all around and it always looks great. 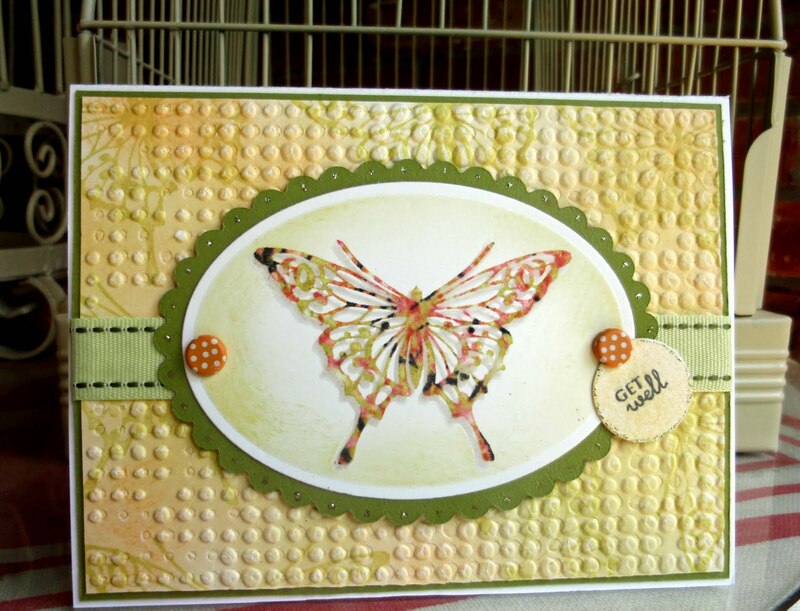 If you look closely, you can see that the background of this card has the same butterfly stamped on it in green. Then I used 2 or 3 colors of distress ink and covered the entire background. A quick trip through the Big Shot Express with an embossing folder and the background was complete. I've listed below the supplies used on this card. I hope you'll be back tomorrow. I have a special Paper Trey Ink edition ready to roll for National Scrapbook Day. All dies today are from Spellbinders - and oval, an oval scalloped and a circle. Distress Inks from Ranger Inc. I have just stumbled across your blog this morning - through SCS I think. I have been poking around for so long I have forgotten where I started. That is a beautiful card & I hope by now your friend is feeling much better. I shall be popping back regularly.